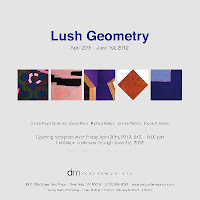 From the gallery: dm contemporary is pleased to present Lush Geometry, an exhibition featuring five artists--Steven Baris, Richard Bottwin, Carole Freysz Gutierrez, Joanne Mattera, and Louise P. Sloane--whose works embrace the visual language of minimalism and geometric abstraction in a manner that is more sensuous than austere. Click sidebar image for more info. Wish I could, looks really wonderful! Hope all goes very well--looking forward to the photos! I loved seeing this work up close and personal. It is subtle but substantial and, indeed, lush. This life of diamonds agrees with you, Joanne! 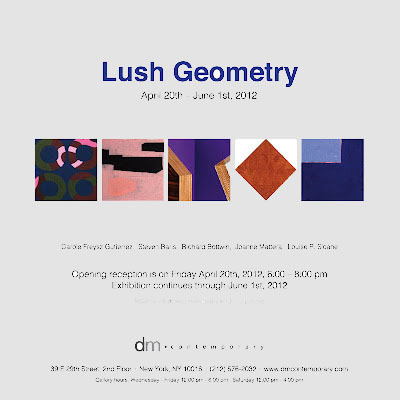 It was a pleasure to see the show at the opening last night. DM Contemporary is a beautiful space and the work was just great.